Earth Day is April 22nd! Here are some great free offers you can take advantage of! Not limited to our area only. Buy one of Caribou Coffee's Earth Day tumblers, you'll get free coffee refills for the rest of the month!! If you have children between the ages of 5 &amp; 10, many Anthropologielocations are hosting a Rainforest Craft event during Earth week (each location has different times and days, so be sure to look at this list for more details). Before heading out, click here to make sure your local store is participating and be sure to call ahead to R.S.V.P. In honor of Earth Day, customers can bring their old denim into any of American Eagle Outfitters' 823 stores across the United States and Canada, and receive a 20% discount on a new pair of jeans. They are partnering with Make It Right (founded by Brad Pitt) to recycle used and unwanted denim into building materials for affordable homes. Any collected unwearable denim will be shredded and recycled into UltraTouch™ Denim Insulation and other building materials for use in Make It Right's affordable homes around the country. UltraTouch Denim Insulation provides energy saving thermal performance and sound absorption, creating efficient, quiet, and healthy living spaces wherever it is installed. Get a FREE Earth Day Reusable Water Bottle with a $50 Buckle Card Purchase. Through April 22nd, get a FREE Heal the World Mug ($8.50 value) when you enter the code 94049C at checkout. Keep in mind that shipping is free with a $30 order. Or, if you are a Penzey's email subscriber, check your inbox for an email titled "We need your Earth Day help." coming from the address penzeys@penzeys.com. This email contains a coupon valid for a FREE mug in-store, no purchase necessary. While supplies last. On Earth Day, the first 50 customers at Jo-Ann Fabric stores will receive a FREE Reusable Shopping Tote! 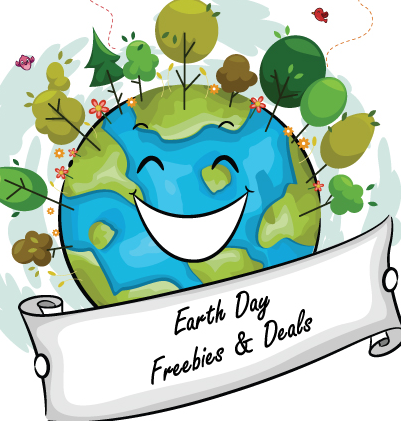 You'll also find FREE Earth Day coloring pages HERE and you can download this FREE The Four Seasons – An Earth Day Interactive Children's Storybookapp! I will continue to update the list this week – let me know if you find additional deals. Thanks My Memphis Mommy &amp; My Dallas Mommy!